At 24 years old, Adam Wainwright burst onto the scene, closing out the 2006 World Series and bringing the Cardinals their first championship in almost 25 years. Over the next 10 years, he was the opening day starter five times and racked up the 7th-most wins of any pitcher despite missing the entire 2011 season and most of the 2015 campaign. If you prefer to measure a pitcher’s performance in Wins Above Replacement as opposed to wins, Wainwright was still a top-10 pitcher from 2007-2016. If you’re still not convinced, he finished in the top three of Cy Young voting four times and received MVP votes in 2009, ’10, ’13, and ’14. 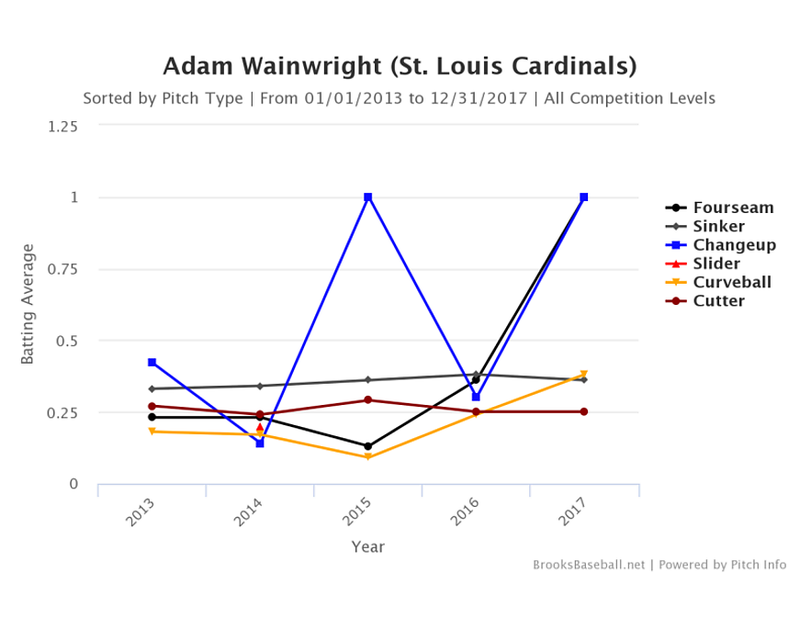 By all accounts, Adam Wainwright was an elite player for the better part of a decade, even after recovering from Tommy John surgery in 2011. Still, by all accounts, he has been anything but elite since. In 2014, Wainwright’s last dominant year (6.1 WAR), he threw almost 230 innings on his way to a 20-9 record with a 2.38 ERA. Since then, he has posted a 4.35 ERA — almost a full 2 runs worse than 2014. Is this just the decline that comes with age, especially as he pitches in his age-35 season? Is it lingering effects from his devastating Achilles injury in early 2015? Admittedly, it’s probably a combination of both. They key, however, is the pitch he used to break onto the scene way back in 2006. The curveball, which was his go-to pitch for years, is no longer devastating hitters with the consistency that it once did. There has been a consistent decline in the percentage of whiffs Adam gets on his curveball. It peaked at 17.22% in 2014 and has fallen to 10.26% early in 2017 — a 40% decrease. But a decreasing whiff rate doesn’t necessarily mean the pitch is failing him; maybe the batters are just making more contact? When looking at how the vertical movement of his curveball has changed over the last few years, it is evident that the pitch has regressed. From 9.22 inches in 2014 to 7.54 inches in 2014, the movement on Wainwright’s curveball has decreased by almost 20%. No wonder the whiff rate decreased by so much — the curveball doesn’t have the necessary movement to trick hitters. This is probably a result of age. How many pitchers maintain the efficacy of their best pitch for their entire careers? None. But the most important thing to do, especially with a curveball, after realizing you can’t get the ball to move like you once could, is to selectively pick when to use it. If Wainwright used his regressing curveball more sparingly, it might be more successful. Instead, he has taken an obviously less effective pitch and increased how often he uses it. Wouldn’t it make sense to use a decreasingly-effective pitch less often? As you can see, instead of markedly decreasing how often he uses his curveball, the long-time Cardinals ace actually increased its usage rate. Now, the graph shows a variance of only a few percentage points — relatively insignificant. 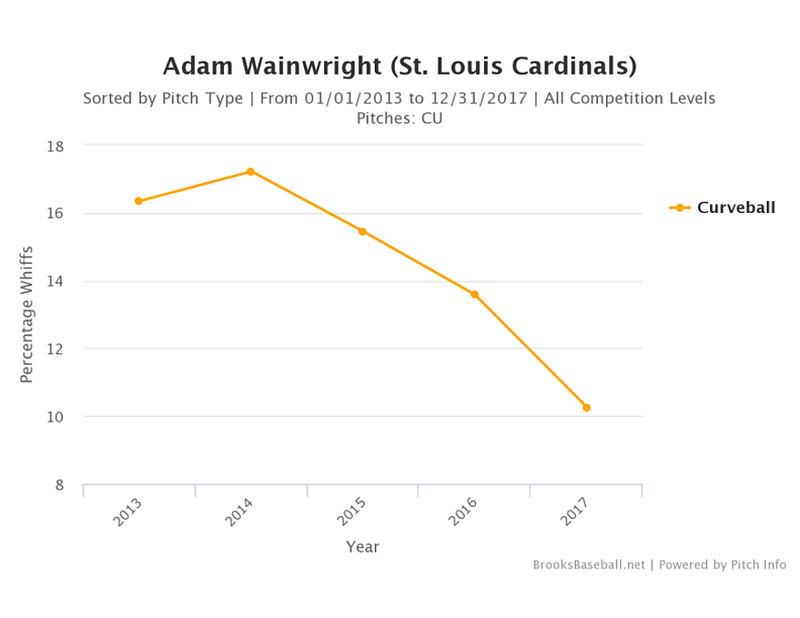 Notably, the 28.89% usage rate is the most Wainwright has ever used his curveball. Let’s do a quick recap. 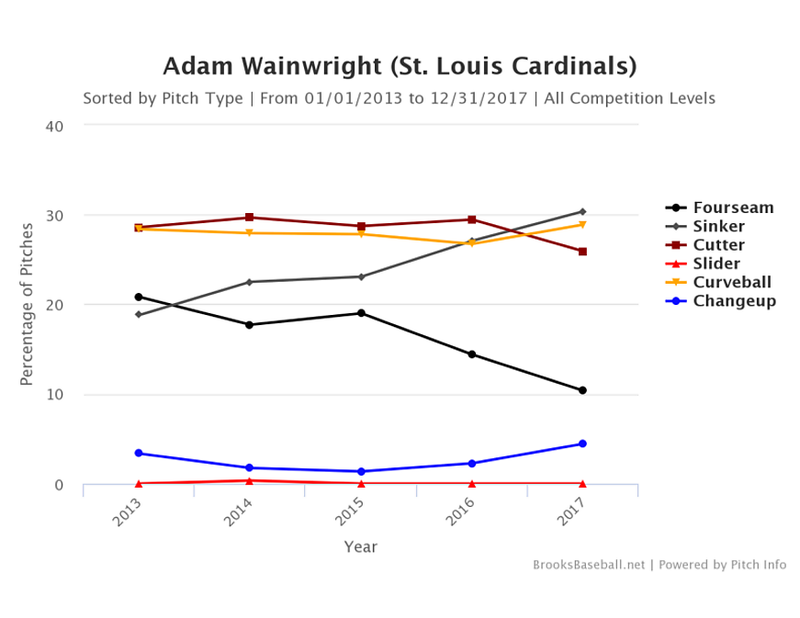 Adam Wainwright is not getting whiffs from hitters because his curveball doesn’t have the movement it once did. And instead of lowering its usage rate, he increased it to an all-time high. What should we expect to happen when a less-effective pitch is used more and more? The batting average against his curveball has risen to .380 in 2017 — more than doubling since 2014. This is alarming. It leaves hitters hoping Wainwright throws them a curve — a stark contrast from a pitch that used to buckle knees. 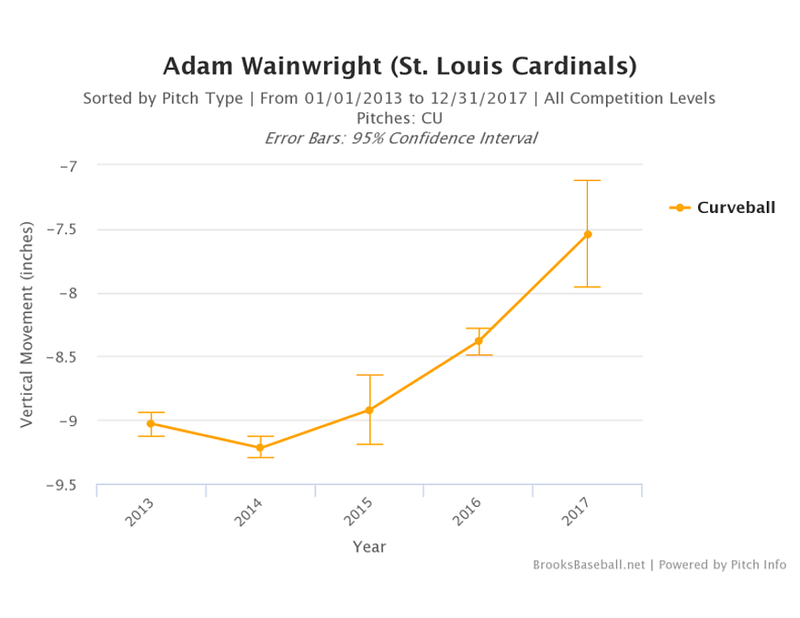 Recently, we’ve seen less of Wainwright’s dominant curveball, and more of his less-effective curveball, leading to more hits, runs, and losses. Wainwright’s success is directly linked to the effectiveness of this pitch. While it may no longer be elite, it can be effective if he saves it for the right moments. 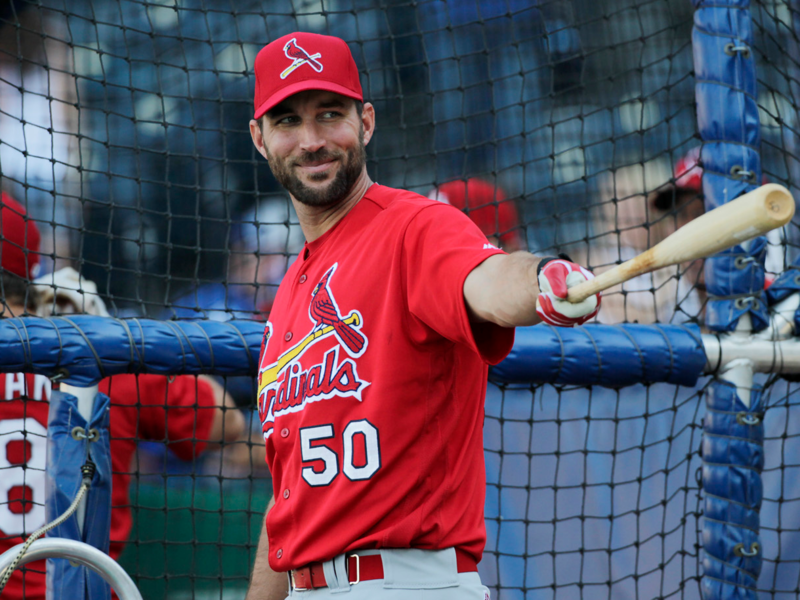 We hoped you liked reading What Happened to Adam Wainwright? by Matthew Ludwig! Cheese, he’s only had two starts so far this season! Wait at least a month before you write this kind of article. For all we know, his curveball will be a lot more effective in his start tonight. Yeah, it wasn’t very good last year either, but there’s a documented reason for that, one that’s supposedly been fixed now. Seems like a reasonable article to me. Wouldn’t this be a thing that you only need a small sample size for? Velo gap between the change and fastball has been awful this year so far. This was fun. When digging into the curveball, did you come across a particular pitch that would help if he threw it more, cutting into that overall curve usage?